And when Bananamour once again failed to move significant quantities you might conclude the problem lies with the label and start looking at a switch. Island Records were known to lavish money on developing and promoting their own artists, but that sort of generosity usually comes at a price and the price usually involves supervision and a degree of diminution in the old artistic freedom. In this case that meant Ayers was absent from the producer’s chair, with his place taken by Rupert Hine. It also meant there was money to throw around, which goes a long way to explaining the presence of a few more notable names alongside the usual suspects. Mike Ratledge and Mike Oldfield are back, but they’re joined by a substantial array of session players. Mike Giles (ex-King Crimson) gets to sit behind the drum kit, but there are three bassists (John Perry, John Gustafson and Trevor Jones), three other guitarists alongside Oldfield and Patto man Ollie Halsall and a whole slew of keyboard players and backing singers. Throw in Lol Coxhill on sax Geoff Richardson’s viola, Ray Cooper on percussion and a guest vocal appearance from Nico and Ayers has plenty of sonic elements to work with. The commercial aspirations are fairly obvious from the start of Day By Day, full of funky pop elements, with punchy backing vocals and a catchy hook, and See You Later definitely channels the Bonzo Dog Band before running straight into Didn't Feel Lonely Till I Thought Of You, one of Ayers’s all-time classics, with a superb guitar solo from Ollie Halsall. Up to that point I was unconvinced about the changed approach, but here we’re back in a familiar environment with added punch from the female chorus. Ayers at his best. Not quite in the same boat, but definitely in familiar territory Everybody's Sometime And Some People's All The Time Blues matches a typical Ayers ballad with a subdued bluesy treatment and a delicate guitar solo (Oldfield this time around). Equally familiar is the introductory lyric in It Begins With A Blessing / Once I Awakened / But It Ends With A Curse, a much more bombastic reworking of The Soft Machine’s Why Are We Sleeping, complete with night club interlude (alto sax by Lol Coxhill) and a grandiose hard rock church organ climax that needs something after it to settle things down. Thirty seconds of Ballbearing Blues might be a throwaway of little consequence or substance but it does the job. 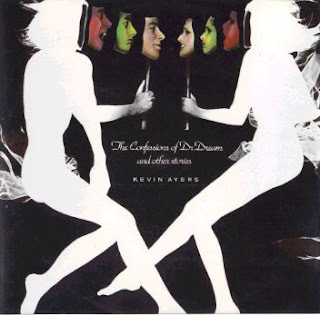 The album’s showpiece, however, is the four part suite labelled The Confessions Of Doctor Dream that starts off with Irreversible Neural Damage but actually isn’t a suite at all, rather four distinct songs segued and crossfaded to create a larger entity. This is presumably the result of pressure from higher up the pecking order since Ayers has gone on record as stating it wasn’t his idea. A vocal duet with Nico, Irreversible Neural Damage runs over the top of a layer of acoustic guitars and spacey synthesised sound effects, delivering a creepy atmosphere that’s as sinister as the title is presumably meant to suggest before an electric guitar lick segues into Invitation, another moody piece that morphs into The One Chance Dance, complete with childish chorus and freak out before Ratledge's organ takes over the running. The final section, Doctor Dream Theme matches a menacing vocal to a threatening riff, a five minute psychodrama that gyrates slowly and was presumably intended to pick up some of the Dark Side of the Moon audience. When it’s done the album proper runs out with Two Goes Into Four, an acoustic ballad that winds things up as it morphs itself into Hey Jude. Non-album singles kick off the inevitable bonus tracks, with The Up Song bopping along quite pleasantly, though one doubts it was ever likely to garner massive airplay. After the Show seems to be about a groupie or similar creature, but, again, one doubts the actual commercial. The B side, Thank You Very Much, is a subtle reflective whisper, while four tracks recorded on 7 July 1974 at the BBC's Maida Vale studios (mightn’t start off very promisingly with a snippet called Another Whimsical Song (Really? Who’d have thought?) before a masterful acoustic rendition of The Lady Rachel. Ollie Halsall’s lead guitar shines on a reworked Stop this Train and he’s even better on a total shredding of Didn't Feel Lonely Till I Thought of You, a definite keeper if ever I heard one. Having worked through the first five Ayers albums in some depth, having landed The Harvest Years 1969-1974 set, however, what we’ve got here is the most commercial outing of the five, and the switch to Island definitely seems to have been made with a view to maximising sales and/or impact. It mightn’t have worked out quite the way he’d hoped or anticipated, but, for mine, it worked out pretty well.